3 Bedroom Victorian Cottage suitable for a romantic weekend or a Family Holiday. Harrowfield is a 3 bedroom, self-contained house from the Victorian era (1894) with many period features such as Queen sized brass beds, high ceilings, Bay Window, Leadlight etc and also modern comforts such as central heating, double spa, modern kitchen and laundry, off-street parking, free XP Computer in Study and free NBN /WIFI access. The rear yard is fully fenced and ideal for children or pets. Pets and children are most welcome. 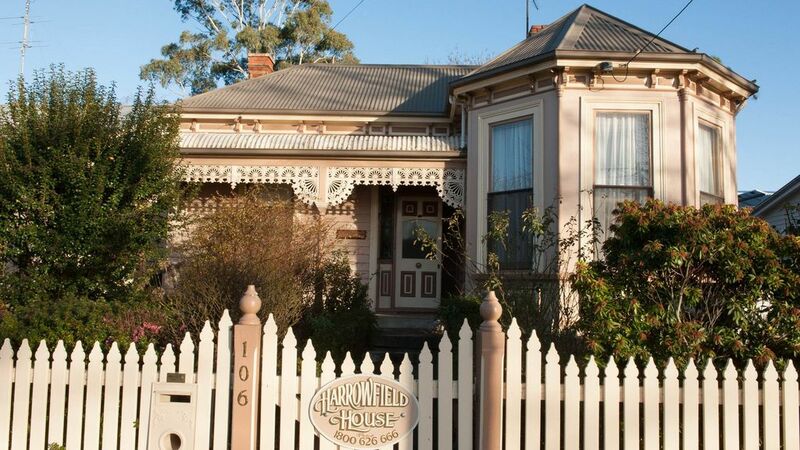 Harrowfield House is located in central Ballarat within walking distance of colleges, restaurants, Lake Wendouree, Botanic Gardens, Supermarket, Deli., Hotels, Bank, Bowling Green, Hospitals etc. Harrowfield is a short drive from CBD shopping incl. Art Gallery, Woolshed Shop, Theatres, Sovereign Hill, Shopping Centres, Wildlife Park, golf courses and is well placed for visits to the Grampians, Wineries, Melbourne, Great Ocean Road, Daylesford, Mount Macedon and more. 90 minute town tours available - also half and full day tours of Grampians, Great Ocean Road, Melbourne, Hanging Rock, Geelong and more. "Blood on the Southern Cross"
Lovely home.Lovely hosts and having my furbabies with me made the weekend..The back part of the house got very hot with air conditioning only being in the front lounge/sitting room..The bedroom ceiling fan was a blessing..The neighbour starting power tools at 9 am on Sunday morning was a bit much but overall I would stay here again.. The house is so lovely and clean and the pressed tin in each room and the fire places, 4 poster bed, spa bath, what more than all this do you need. Oh and a garage for the trailer more than I expected. Highly recommend this bnb. Bev and Jim 5 star hosts. Glad you enjoyed your stay at Harrowfield . Parking in the street is normally not a problem but having the lock-up garage available does put one's mind at rest. Look forward to seeing you back again. Had a lovely stay at Harrowfield house. Such a beautiful house, lots of character and very spacious. Location was very handy for both Lake Wendouree and the town centre while being in a quiet area and our dog was welcome too. A wonderful warm & cosy cottage. Definitely recommend! Close to shops and lake. Very quiet, clean and comfortable. Will be back! Thanks for your review - glad to hear you enjoyed your stay in the warm at Harrowfield House and all the exciting Winter Wonderlight Activities at Sovereign Hill and other places around Ballarat at that time. We look forward to having you stay again in the future.